figure 9.58 Compressed Lepidostrobus cone (Pennsylvanian). Bar = 2 cm. one type of spore) and bisporangiate (having two types of spores) forms, so that taxonomic problems within the genus are considerable. suggested that the name Lepidostrobus be used for cones containing only small spores (monosporangiate) and Flemingites for bisporangiate strobili containing both microspores and megaspores (FIG. 9.62). 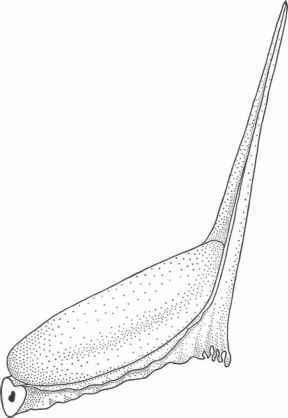 Other authors have used cone morphology and in situ spores to more accurately circumscribe individual species within Lepidostrobus (Bek and Oplustil, 2004, 2006). 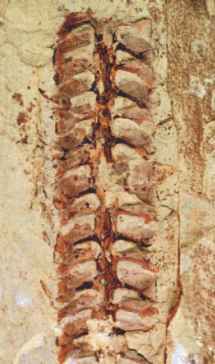 figure 9.59 Compression specimen showing axis of Lepidostrobus cone with helically attached sporophylls (Pennsylvanian). Bar = 1 cm. 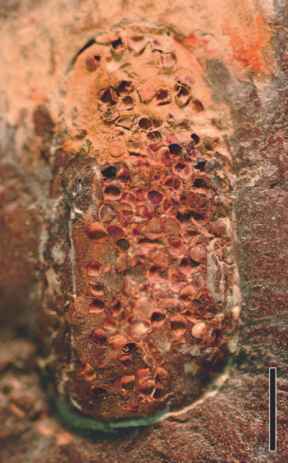 figure 9.60 Longitudinal section of distal end of perminera-lized Lepidostrobus cone with distal sporangia containing spores (Pennsylvanian). Bar = 3 cm. 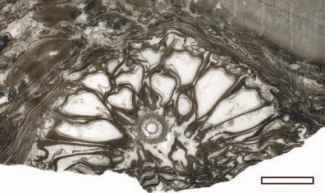 figure 9.61 Transverse section of permineralized Lepidostrobus cone showing central axis and helically arranged microsporophylls (Pennsylvanian). Bar = 2 cm. 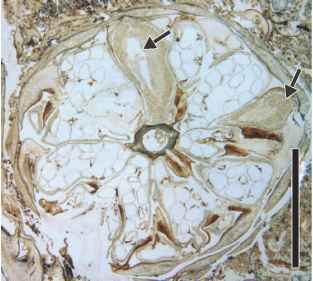 figure 9.62 Transverse section of Flemingites schopfii cone showing microsporangia (arrows) intermixed with megasporangia (Pennsylvanian). Bar = 5 mm. 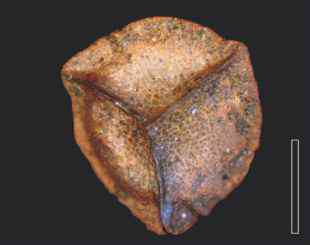 One of the oldest lepidodendrid cones is Lepidostrobus oldhamius, known from Lower and Middle Pennsylvanian deposits in both North America and Great Britain. Specimens range from 2-6 cm in diameter and exceed 30 cm in length. Sporangia are massive and, depending on the stage of development, may have an irregularly shaped pad of sterile tissue extending from the sporophyll into the lumen of the sporangium. All of the sporangia contain small (20-30 pm) spores that have a trilete suture on the proximal surface and delicate spines on the distal face. Dispersed spores of Lepidostrobus are often preserved, and one of the common generic names applied to these grains is Lycospora (Willard, 1989). Lepidostrobus shanxiense is a slightly smaller cone from the Xishan Coal Field in China (Wang et al., 1995). An interesting Lepidostrobus cone, L. xinjiangensis, also from China, occurs in Upper Devonian rocks (Wang, Q. et al., 2003a). The discovery of this species suggests that segregation into micro- and megasporangiate cones had already taken place in the lepidodendrids by the Late Devonian. 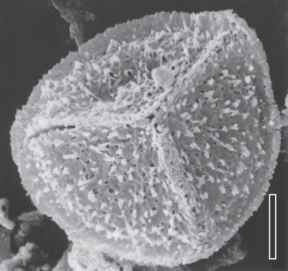 Flemingites schopfii is a permineralized bisporangiate cone that resembles a massive modern Selaginella strobilus in general organization (Brack, 1970). Specimens are up to 8 cm long and 1.3 cm in diameter. The arrangement of parts and cone anatomy are identical with those of L. oldhamius , except for the presence of two types of spores in F. schop-fii. Distal sporangia (FIG. 9.63) contain a large number of Lycospora-like microspores (FIG. 9.64), some still in tet-rahedral tetrads; more basal sporangia contain 12-29 tri-lete megaspores (Brack-Hanes, 1978). The megaspores range from 700-1250 pm in diameter and are marked by an elongation of the proximal surface into an apical prominence or gula. Dispersed megaspores of this type are called Valvisisporites . figure 9.63 Suggested reconstruction of sporangium of Flemingites schopfii (Pennsylvanian). figure 9.64 Proximal surface of Lycospora-type spore showing surface ornament, trilete suture, and equatorial cingulum (Pennsylvanian). Bar = 7pm. 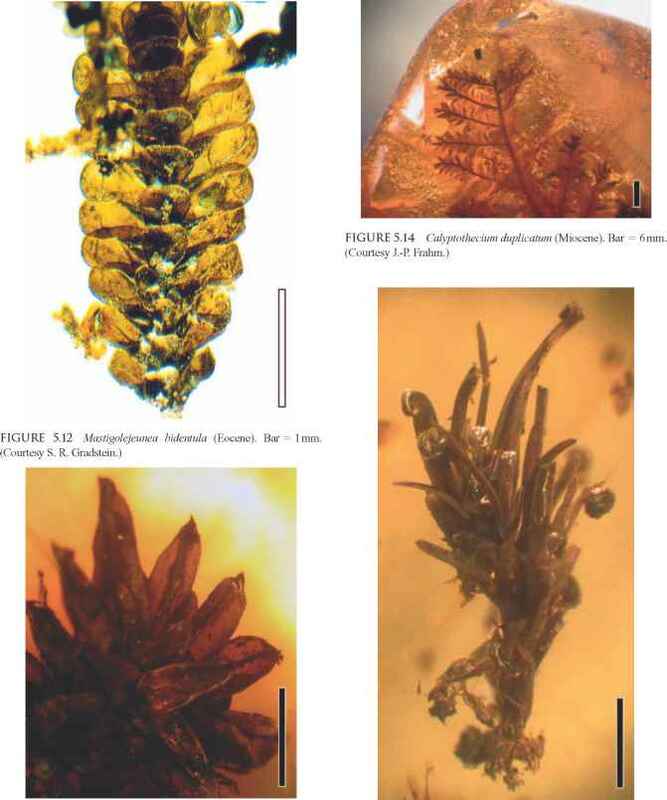 figure 9.65 Megasporangium containing numerous Triletes sp. spores (Pennsylvanian). Bar = 5 mm. might be more appropriate than microspore, as the exact function of these spores in the life history of the plant is currently unknown. Mixostrobus givetensis, from the Middle Devonian of Kazakhstan, is a bisporangiate cone with an irregular arrangement of micro- and megasporangia. In some strobili, one type of sporangium is the dominant type, but this does not depend on the size of the cone (Senkevitsch et al., 1993). Cones assigned to the genus Kladnostrobus from the Pennsylvanian of the Kladno-Rakovmk Basin, Czech Republic, differ from other lycopsid reproductive structures in that the in situ spores are reticulate and resemble the dispersed spore genera Convolutispora, Camptotriletes, Reticulatisporites, and Dictyotriletes (Libertm et al., 2005). figure 9.66 Megaspore of the Triletes-type showing proximal triradiate ridge and ornamentation (Pennsylvanian). Bar = 1 mm. 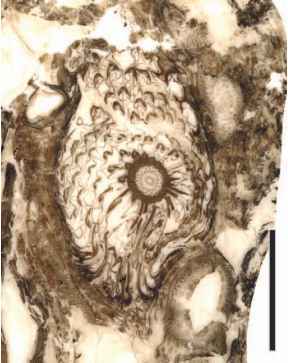 figure 9.67 Partial transverse section of Lepidocarpon palm-erensis cone (Pennsylvanian). Bar = 1 cm.